Excuse Me? This Was The Reason Why CNN's Parkland Town Hall Event Nabbed A Cronkite Award? Uh, they allowed Scott Israel to blatantly lie about his own culpability and let misrepresentations about the NRA to go unchallenged while treating @DLoesch like she personally shot the kids. This is a total joke. Nothing was advanced. Well, one thing was advanced: the narrative that the Left hates Republicans, gun owners, rural voters, and NRA members. Oh, and the spokesperson for the National Rifle Association, Dana Loesch, was the professional in the room, attending the hostile event, and answering questions from the student body that was rocked by this tragic shooting, which was, once again, not the fault of the NRA. Parkland is in Broward County, one of the bluest, most Democratic bastions in the Sunshine State. This was going to be a circus. Loesch described it as a WWE-style event in a lengthy Twitter threat bashing the event, saying it was a “show,” and one where people verbally harassed her. Yeah, sounds like an environment that’s prime to advance a conversation about gun violence. 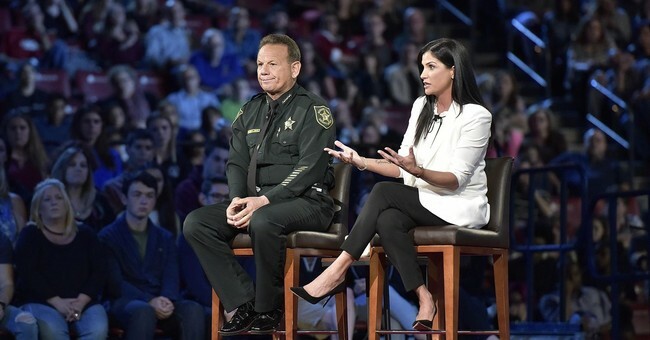 The second portion of CNN’s town hall/mob promoting gun control on Wednesday night featured Broward County Sheriff Scott Israel and NRA spokeswoman Dana Loesch and, on cue, it was brutally hostile towards Loesch. Along with repeatedly being heckled by students and other attendees as a “murderer,” Stoneman Douglas student Emma Gonzalez questioned Loesch’s motherhood. Loesch was booed seconds later, but — nevertheless, she persisted. “Now, I want to answer your question and I want to be allowed the opportunity, which is why I am here, to talk and have this discussion with you all and answer these questions. This is why I came down here. I don't believe that this insane monster should have ever been able to obtain a firearm. Ever. I do not think that he should have gotten his hands on any kind of weapon,” Loesch continued. She added that, on behalf of the NRA, its millions of members do not believe that the gunman or anyone who was “crazy” should be able to purchase a gun. Cameron Kasky smeared the Senator by equating him to the shooter that killed 17 of his classmates. And Tapper thanked him for all of it. “I'm sorry, I know I'm not supposed to do this, but I'm not going to listen to that. Senator Rubio, it's hard to look at you and not look down the barrel on an AR-15 and not look at Nikolas Cruz, but the point is: You're here and there are some people who are not,” Kasky spat. After Rubio answered his question, Kasky began to browbeat him for the money the NRA donated to his campaign, basically insinuating he was being bribed. “And this is about people who are for making a difference to save us and people who are against it and prefer money. So Senator Rubio, can you tell me right now that you will not accept a single donation from the NRA in the future,” he demanded as the crowd went crazy. Oh, and David Hogg, one of the main faces of this new anti-gun push, said that AR-15 owners hunt human beings, or something because they have scary, scary rifles…that are owned by millions of Americans. Sorry, this whole event was straight trash. It was a massive in-kind media contribution to the anti-gun Left that displayed a gun confiscation circus to the masses. The NRA is not evil, they’re one of the oldest civil rights organizations in the country that promotes the views held by millions of Americans. Freedom, liberty, and the right to own firearms are not perverse. Mob rule, browbeating folks, and berating them for holding differing views because they might not block you from enacting a truly pernicious left-wing agenda is odious. And it’s becoming a hallmark characteristic of left-wing politics. If we cannot convince people, then search and destroy. Heck, you can even lie…because the left-wingers think they’re morally right. That’s the license to peddle fake news or outright garbage to make your case. Oh, and another thing, Loesch and Rubio were deep in enemy territory. They attended a hostile event, took questions, the jabs, and were made available to the public, even if this was an appalling piece of liberal smear theater. Say what you want, but conservatives are willing to do this. Democrats are not. Case in point, Fox News is barred from hosting a Democratic primary debate. I wish I could be more outraged. I cannot. This has sadly become an “as expected” moment when it comes to the liberal media and their antics. What can we do? Well, for starters, we can vote for Donald Trump in 2020 and watch the liberal media’s world, and that of their viewers, burn to ash again.